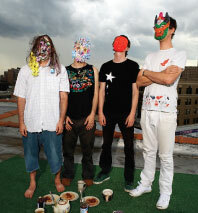 Animal Collective is as strange a young rock band as New York has ever known. They play music full of psychedelic noise, with peculiar vocals arranged in choral yelps. They answer to cryptic character names—Avey Tare, Panda Bear, Geologist, and Deacon—and have been known to dress as giant turtles and rabbits with bloody fur. They also managed to draw 3,500 people to South Street Seaport for a concert this summer. Some were clearly tourists lured by tall ships and shopping, but most were fervid music scenesters eager to hear what one of New York’s underground treasures would do next. That same otherworldly quality infuses Strawberry Jam, Animal Collective’s sixth album since starting out in New York in 2000. In its early days, the band was at the forefront of “freak folk,” a movement that laid gentle folksy murmurings against experimental musical backdrops. Since then, Animal Collective has evolved; its songs continue to meander and digress, but the mania seems driven by a greater sense of purpose. All their howls and moans and unusual tones from synthesizers and guitars coalesce into hooks that hint tantalizingly at pop. The Animal Collective sound is so hard to pin down because it offers no easy reference points to other bands. After a decade during which the most popular New York bands have meticulously mimicked their forebears, Animal Collective has flourished, in part, by letting their roots grow wild and untamed.